What is wrong with Koji Uehara? Koji Uehara gave up the tying and winning home runs to the Yankees in the ninth inning Thursday night. 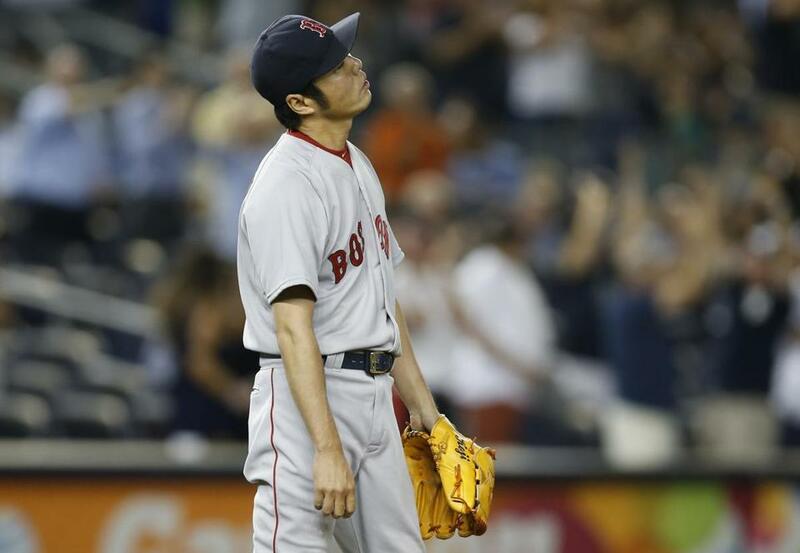 NEW YORK — Where have you gone, Koji Uehara? The pitcher Boston fell in love with is now a shadow of his former self. Has Father Time finally caught up with him? Has the finish on his famous splitter indeed deserted him? Whatever is going on, it is disturbing. Not that the Red Sox’ season means anything at this point, but serving up a pair of ninth-inning home runs to Mark Teixeira (to tie) and Chase Headley (to win), keeping the Yankees in the wild-card race with a 5-4 victory, continued a nightmarish ending to Uehara’s season. John Farrell hinted that discussion concerning shutting down Uehara for the rest of the season could commence after Thursday’s outing. The Red Sox gave him eight days of rest prior to his previous appearance on Tuesday. Ten of the 18 runs he’s allowed this season have come in his last six games. Uehara was beside himself after the loss. He gathered the Japanese media. “I have nothing to say. It’s all my fault,” he said. With that, Uehara left the clubhouse. He was not coming back to speak to the English-speaking media, as he usually does. There are a few story lines here. What if the Red Sox were in contention? How devastating would it be to have Uehara pitching as poorly as he is? In retrospect, should the Red Sox have dealt Uehara when they had the chance? There were numerous teams that inquired around the trade deadline who must be extremely happy Boston said no. While there’s universal support for Uehara in the Red Sox clubhouse given his incredible 2013 season and predominantly strong 2014, is there faith he can do the job in 2015? How far will the Red Sox now go with an offer to the pending free agent if the feeling is he’s finally broken down? The 39-year-old made his 61st appearance Thursday, and his workload is in line with other closers in baseball. He obviously had a heavy workload last postseason, which led the Red Sox to start him out slowly in spring training. There was a period in April where he needed a few days to rest when he experienced shoulder stiffness, but for the most part, Uehara has pitched this year without restriction. The Red Sox have not worn him down. He’s averaged fewer pitches per plate appearance this year than he did in 2013. And Uehara has never used the word “fatigued” to describe how he feels. He had held steadfast that he’s having a mechanical issue with his splitter. And that is his best pitch. He throws two kinds, but it seems the one he throws to lefthanded batters is hanging up in the strike zone like a balloon. “Any time you give up the lead in the fashion that we did [Thursday], those are tough losses to take,” Farrell said. “We had given Koji eight days off — got him an inning of work the other night. The lack of finish to his split is what allowed a couple of pitches to stay in the zone late and led to a couple of home runs. Should they re-sign Uehara, the Red Sox will have to come into 2015 with a co-closer. No team can depend on a 40-year-old closer to take on the bulk of the workload, unless his name is Mariano Rivera. It doesn’t appear the Red Sox would want to go as high as a $15-plus million qualifying offer to him, and now might be a good time to tie him up for next season at a rate that reflects his contribution to the team the last two seasons, and because he’s starting to decline. Uehara certainly didn’t want the Yankees to breathe again. Every time it appears the Yankees are cooked and out of the race, they do something dramatic to live another day. Uehara gave the Yankees hope as they host the Kansas City Royals this weekend. This is not the Uehara we know. That Koji would have retired the Yankees in order on eight or nine pitches and then engaged in his leap and bump with Mike Napoli and take part in shenanigans with his teammates. We haven’t seen that for so long. Where have you gone, Koji?